A good home stair lift is a wonderful solution for seniors with mobility issues who have trouble with steps. There are a number of models available that will carry seniors up and down the stairs in a safe seated position, giving them access to the second story or basement level of your home. The essential spots in a home for a stair lift are on your stairway that proceeds from the ground floor to the second floor or the basement to the ground floor. With a stair lift, all floors in your home are readily available, so no matter how many times you need to go upstairs to get a sweater or to the basement to do your laundry, you can travel comfortably and enjoy your home. There are two basic types of stair lifts that are sold today – straight and curved. A straight stair lift travels in a straight line up a flight of stairs, uninterrupted by landings, bends, or curves. Curved lifts are more elaborate and go around corners, bends, and changes in direction. A variety of staircase configurations, from straight run to L-shape, sweeping curve, and staircases with a turn at the very top of the flight can be accommodated by modern stair case designs. If there is a doorway at the top or bottom of the stairs that may be blocked by the rail of the stair lift, there are models designed to overcome the problem. A rail with a reduced overhang that will not protrude into the hallway is one option. If there is a door at the bottom of the stairs, a folding track or hinged rail stair lift can be used. This will allow you to gain access to a door that would be blocked by a normal rail and prevents a tripping hazard. You may wonder if the stair lift or installation of the stair lift will damage your stairway, or if it will have a structural impact on an older home. The key is to hire trained professionals to install the stair lift. A qualified technician knows the specifications and requirements of a lift and can make it feel like a natural part of your home. Qualified technicians can accommodate virtually every stairway shape, size, and angle to carry you smoothly in a straight line, around corners, and up multiple flights on either side of the staircase. You can also send the lift up, call it down, and use it to carry light items either way using several different types of control styles, from push-button to pendant to toggle switch. 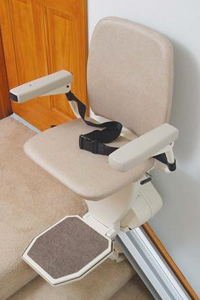 Stair lifts come in compact designs with seat, arms, and footrests that fold up when not in use. They are designed to compliment your home décor in several fabric or vinyl choices. Look online for stair lift models from the leading companies that are offered at economical prices. They are available for sale or rent, professionally installed, with extensive warranties and service contracts to protect your purchase.